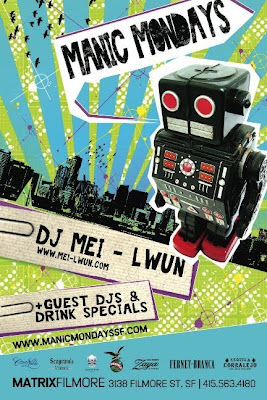 San Francisco's favorite weekly party MANIC MONDAYS rolls strong this week with resident Dj Mei-Lwun and special guest Dj HellaMiles. The Dance Floor will be ablaze with the turntable friction provided by this dynamic combination! Dirty disco dancing and debauchery aided by drink specials on Fernet and Corralejos so make your way down early to partake in the revelry!! MATRIXFILLMORE 3138 Fillore st sf 9-2 +21 Dress to express! !